I was planning on reviewing this back last year.. but just like a lot of my recent reviews, time flies by. I received an awesome package from the friends & folks over at Double Trouble Brewing, home of the popular Hops & Robbers IPA, among other beers. They sent me some cans of their Grapefruit IPA (review here) and some cans of Hops & Robbers Unfiltered Pils, this review's beer. Aside from stubbornness, I don't know why it took me this long to review this beer. I previously mistook them as the guys behind the Trailer Park Boys beers, but they aren't associated with them at all, it's North American Craft that makes it, though it does appear that NAC distributes Hops and Robbers. I'm not a fan of pilsners but I feel like the craft pilsner market is only going to explode over the next five years. I had a few craft pilsners in Quebec and Manitoba and I was shocked how nice they tasted.. even to the point that I was willing to purchase them again! 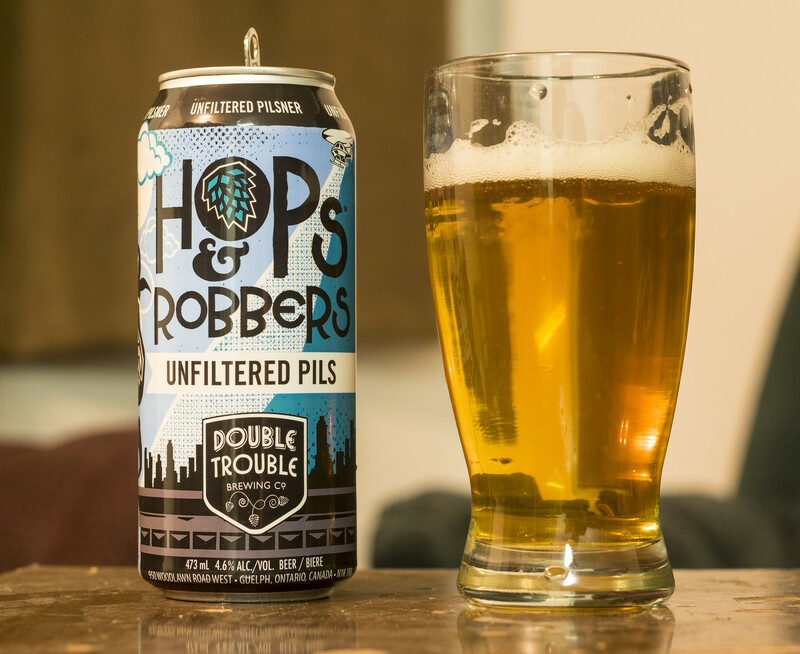 Hops & Robbers Unfiltered Pils is described as being a rich and hoppy lager with sparkle and pizzazz. True Pilsner taste is in harmony with a bubbly balance of carbonation. Served cold, it is full of thirst-quenching magic. Appearance: This certainly pours like your typical North American pils at first, it pours a crisp, golden straw yellow body, a hefty amount of micro-carbonation in the body, and mostly clear for it being unfiltered. The beer also has a nice frothy snow white head on top, the head diminishes pretty quickly but after letting the beer settle, I still have a whole finger's worth of frothy white head on top. Well, once you pour the rest, it looks more like a hefeweizen, completely cloudy and bright orange.. but damn, it looks good. Maybe I should've reviewed this 6 months ago? Yeah, probably. Aroma: Notes of wet mushed cereals - a rich graininess from the barley, a good grassy hop presence that gives off a bit of an alfalfa aroma to it. Notes of lemon, crackers and a hint of chewing gum. So far, this has notes of what you expect from a typical craft pilsner, it's crisp, light, aromatic and not too hoppy or malty. Taste: Crisp and light, yet sweet and somewhat hoppy. The first thing I get from this beer is that it has a crisp and light pilsner flavour that's mostly crackers, lemon, a hint of cracked pepper and the typical notes you'd see in a pilsner. This definitely has more character than your typical every day pilsner - there's a very grassy yet somewhat bitter hop presence that lingers on the tongue for quite a while. Quite easy to drink for being an unfiltered pilsner.. and I'm not a fan of pilsners usually.